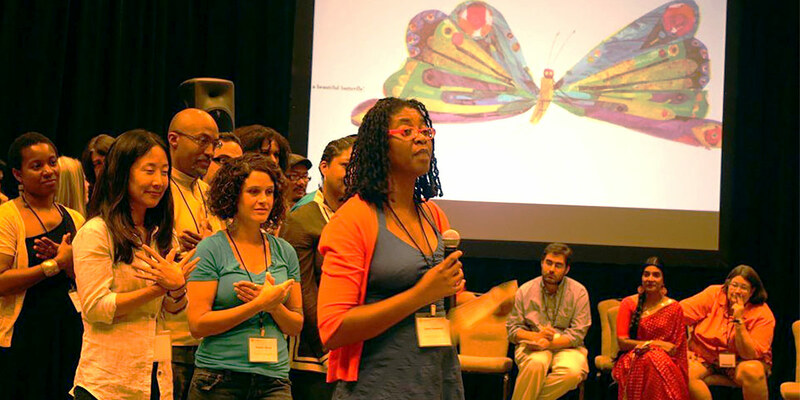 The Creative Change Retreat brings together a diverse group of leading artists, entertainers, media makers, advocates, activists, and funders committed to transformative social change. This national retreat combines intimate strategy sessions, group conversations, showcases of innovative work and interactive presentations to create fertile ground for sharing, connection, and reflection to inspire, amplify and mobilize support for social justice values and solutions. The first retreat, held in 2009, was initiated by a group of social justice, philanthropic, and arts leaders that include Alan Jenkins, Connie Heller, Jason P. Drucker, Michelle Coffey, and Ann Beeson. Creative Change is an invitation-only event. For more information, please contact Betsy Richards at brichards@opportunityagenda.org. We have been fortune to welcome incredible groups of artists, creatives, musicians, filmmakers, comedians, and cultural influencers have attended the Creative Change Retreat. Read the full list of Creative Change Retreat participants. Creative Change is made possible through the generous support of the Akonadi Foundation, the Chorus Foundation, Compton Foundation, Open Society Foundations, Ford Foundation, Lambent Foundation, Nathan Cummings Foundation, Surdna Foundation, Time Warner Foundation, Unbound Philanthropy, Embrey Family Foundation, and anonymous donors. The Opportunity Agenda engaged in a multi-year (2009–2013) and multi-layered evaluation of its Creative Change Retreat. The report is here.